Work is finally due to begin on a €7m flood defence scheme in Clonakilty, Co Cork, three years after the government launched a plan to protect the town from rising river waters. It is one of 27 flood defence schemes across the country identified by the Sunday Independent where work is running behind schedule. The Office of Public Works (OPW) has now issued a tender inviting applicants to come forward and undertake the construction of flood defence walls, embankments and pumping stations. A contract is due to be offered in September with work due to begin early in 2017. Building was due to start on the project last October but was delayed before the country saw some of the most devastating floods in recent memory last winter. The OPW said the project will be completed in two years. "These processes cannot be progressed faster due to legislative requirements, environmental constraints and public procurement regulations," said a spokesperson. She added that work will eventually commence once Public Expenditure Minister Paschal Donohoe has carried out an independent assessment of the scheme's Environmental Impact Statement. 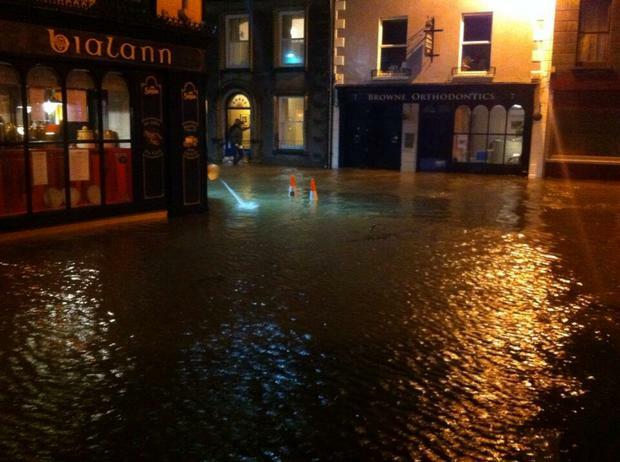 Clonakilty has a long record of flooding over the past 60 years. It was severely hit in 2009 and 2010 before being flooded another five times in 2012. More than 100 homes and a further 170 businesses were damaged by rising water during one flood in June 2012, causing more than €6m worth of damage. The new flood scheme will see the installation of water level sensors and flow monitors to prompt the use of new purpose-built storage areas for flood waters. It is one of 27 schemes across the country in counties Cork, Waterford, Clare, Dublin, Galway, Wicklow, Mayo, Wexford, Limerick, Kildare and Tipperary that are running behind schedule. Farmers Mikie and Gertie Dunning, from Athlone, were among the worst hit by floods last Christmas . They are still dealing with the aftermath eight months later. Mr Dunning said: "I got €17,000 from the hardship fund to fix up the farm afterwards but ended up paying almost half of it back in tax and Vat. We had to get a credit union loan and spent another €3,000 to try and get back to normal. "I am afraid of it happening again because we are just two pensioners and we are not able for all that. We were under water for two solid months during the winter." The OPW said it aims to have two flood schemes finished by the end of this year and five more completed in 2017. The Clonakilty scheme will not be finished until 2019. The flood defence schemes are part of a capital programme worth €45m per year. However, spending will be increased to €52m this year.